While coconut trees had snapped into two or even four parts after Cyclone Gaja struck, the palmyrah trees were intact. When Cyclone Gaja hit Tamil Nadu, it caused widespread destruction, but most of the palmyrah trees were unaffected and stood firm. Palmyrah is the state tree of Tamil Nadu and has ecological and economic value, aids biodiversity conservation and is climate resilient. With an observed drop in palmyrah count, various actions to protect the tree are underway and there is a clear need to consider promotion of its cultivation. 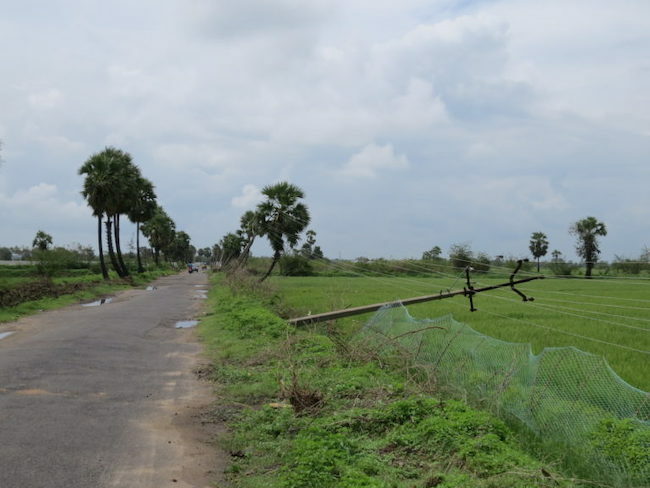 The narrow two-lane road from Nagapattinam to Thiruvarur is flanked by paddy fields, with palmyrah trees demarcating the road and the fields. Places such as Sikkal and Manjakkollai, though more than five kilometres from the Bay of Bengal, bore the brunt of Cyclone Gaja that hit the east coast on November 16, 2018. Huge branches had snapped, trees lay uprooted and electric poles leaned precariously or were flat on the ground in a mangled mess of cables. However, most of the palmyrah trees stood firm and rooted. While coconut trees had snapped into two or even four parts, the palmyrah trees were intact. Palmyrah (Borassus flabellifer) is the state tree of Tamil Nadu. From the leaves being used for manuscripts, to the split trunk being used as roof joists, palmyrah trees had been an integral part of Tamil life. With changes in cultural and social milieu, they lost their importance. In realty and industrial agriculture, they were considered worthless and axed, resulting in significant loss in tree count. 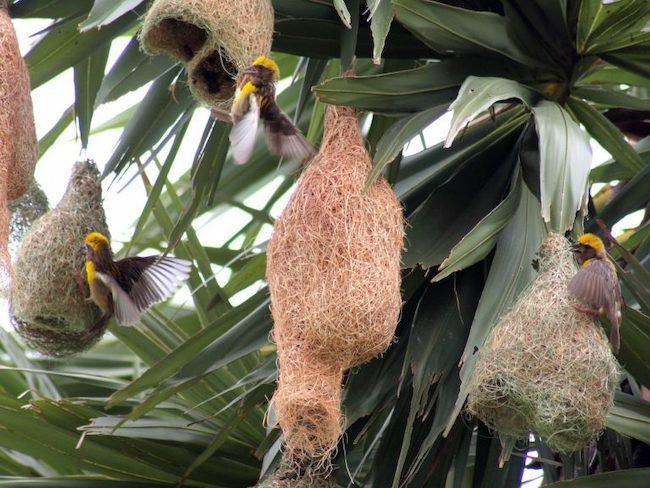 A faunal shelter, palmyrah trees are the choice of baya weaver birds for nesting. Photo by Samuel Theodre. Cyclone Gaja having demonstrated its sturdy nature, and its ability to lessen the impact of natural forces, the importance of palmyrah tree is being appreciated. Palmyrah trees are commonly seen between agricultural fields in Tamil Nadu. “People used them to mark boundaries, given their long life of 120 years,” said Ranjit Daniels of Chennai-based Care Earth Trust that works on biodiversity conservation. Planted around water bodies, they are believed to recharge water. According to Sobhana Raj, botanist and retired principal of Scott Christian College, Nagercoil, the root has a central fibre surrounded by a spongy layer that stores water. “They played a significant role in circulation of water in aquifers,” he said, citing an academic paper. “Cut root exudes water. Though it has not been proven, it’s possible that the roots help in recharging water,” he added. Panchavarnam R., former chairman of Panruti panchayat and author of a book on palmyrah, said that they were traditionally planted where forests ended and human habitations started. Planted without much gap, the rows of trees prevented carnivores and elephants from venturing into villages, thus preventing human-animal conflict. According to Godson Samuel, a priest and field director of Palmyrah Nation, which works on palmyrah conservation, the tree shelters birds and reptiles such as snakes and monitor lizards. “Peacocks rest on them and sunbirds drink nectar from the inflorescence,” he said. Bird watchers have observed parakeets and Indian rollers nesting in palmyrah trunks. Other birds like palm swifts, silver bills, white-breasted kingfishers and shikras have been observed on them. On a single palmyrah tree, many baya weaver nests can be observed in villages. Earlier, all parts of living and dead trees found use in everyday activities of rural communities. Trunks were used as rafters and pillars for house construction. As leaves were periodically pruned, the long and sturdy leaf bases were used as fences and the leaves as roofing material. Once concrete structures became popular, palmyrah lost its importance. In 1987, the Tamil Nadu government banned toddy, a fermented drink tapped from the inflorescence, adding to the decline of palmyrah products. According to Samuel, more than a million (10 lakh) people lost their jobs because of the ban. With the younger generation preferring other jobs, the number of climbers declined. This led to farmers selling palms in their land and village committees selling those in common land, as firewood to brick kilns. According to Veilmuthu P., chief editor of a popular Tamil magazine, palmyrah acts as a natural barrier against climatic forces. “The damage to Cuddalore and other coastal areas caused by cyclones Thane and Nilam could have been vastly minimised if thousands of palmyrah trees had not been cut,” he said. Taller than coconut trees, palms are sturdy and strong and do not fall easily. “The fibrous trunk has a sort of elasticity that enables it to bend and not break,” said Daniels of Care Earth Trust. This helps them withstand heavy winds and cyclones. “The crown of fan-shaped leaves is light in weight, lending it resilience against wind,” said Panchavarnam. The leathery leaves are also sturdy against heavy rains and winds. Aaron Doss, a Chennai-based travel operator, observed how the palm leaf roof of a hut at Vizhunda Mavadi village in Nagapattinam district was not damaged at all during Cyclone Gaja. “It was just about 500 metres from the sea. Even Mangalore tiles had been blown away from roofs, but not this roof of palm leaves,” he said. The fibrous roots that go deep and wide bind the soil well, preventing soil erosion. “The root structure is such that it stabilises the soil, and conserves soil moisture,” said Prabhu T., of Agricultural College and Research Institute, Killikulam. Palms grow in all types of soil and climatic zones. They are seen in large numbers in coastal Nagapattinam, fertile Thanjavur and in arid Ramanathapuram. Besides their climate resilience, proponents of palmyrah cite other reasons for conserving them. “We inherited rich Tamil literary treasures including epics Silappadhikaram and Manimekalai in palm leaf manuscripts. It’s part of our legacy. Now that we know the health benefits of palm products, we need to conserve them,” said Manivannan Gandhi, of PanaiOlai, that has planted 3,500 palm seeds around Madurai. Proponents find toddy in moderate amounts healthful. “Toddy is not an intoxicant but a part of food and medicine,” said Nallasami C., of Tamil Nadu Toddy Movement. While government departments do not have a census, everyone agreed that palmyrah count has drastically reduced. To revive the same, youth, communities and some political parties have started planting seeds in public places. Conservation without economic benefits holds no appeal. 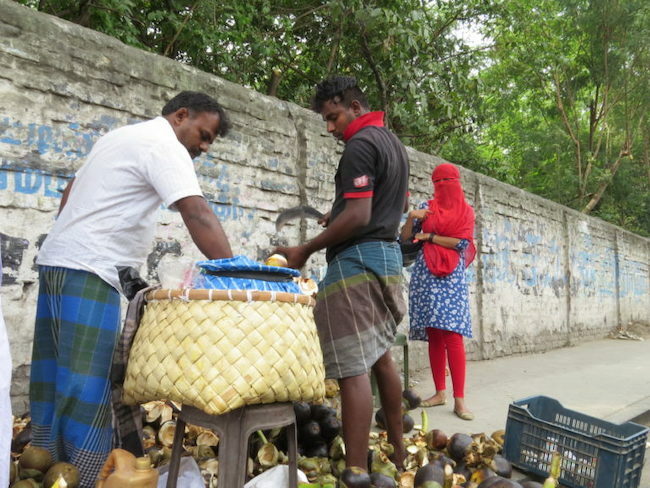 Rasu Mayilvahanan and his friends, all working professionals, promote sustainability and livelihood, by engaging women to make palm leaf products. Many women are turning entrepreneurs, making snacks using palm jaggery. Suresh. V, a diploma holder in mechanical engineering, quit his job in a reputed company, to sell nungu, the jelly-like tender seeds. “I earned Rs. 13,000 in my job, now I earn double that,” he said. As trees in each region have different fruiting season, he is busy for eight months. Selling edible tender seeds of palmyrah fruit is more rewarding than a salaried job for Suresh. Photo by Jency Samuel. Theri Kumar from Rayagiri in Tirunelveli district said that villagers sell a tree for Rs. 150, without appreciating its economic value. With an average yield of 150 litres of padhaneer or neera sap extracted from the inflorescence, 25 kg of jaggery, 15 kg of palm sugar and non-edible products such as fibre, leaves and coir, Veilmuthu estimates an average income of Rs. 3,500 from one tree. With about 450 trees per acre, a palmyrah farmer could earn Rs. 1.5 million (Rs. 15 lakh) per annum. However, palmyrah was never considered a plantation crop. “Tamil Nadu Palmgur and Fibre Marketing Federation (TNPFMF) started in 1956 to market palm products, continues to do so. 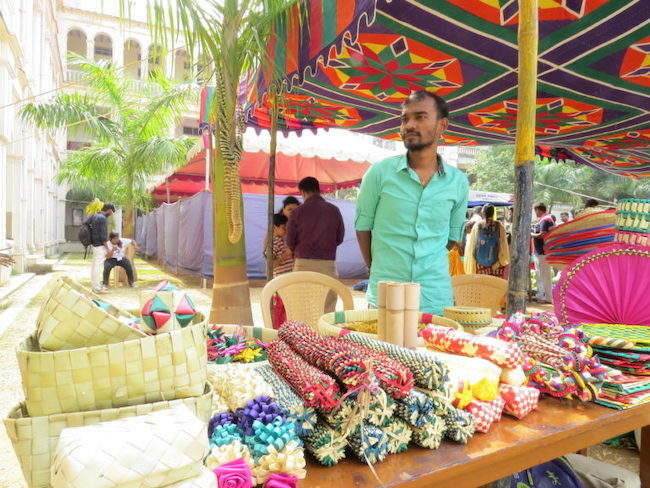 The government supports artisans, supplying free tools, and buying products from eight district federations,” said Naveen Kumar. “After ten years, there won’t be any climber to tap neera, as it’s difficult work and the present climbers are above 40 years,” said Annamalai, staff at TNPFMF. “100 litres of neera yields 10 kg of jaggery and needs 100 kg of firewood. The returns have to be attractive enough for an artisan,” he added. Difficulty in climbing palmyrah trees that grow to 30 metres is a deterrent. “Attempts to make shorter varieties have been unsuccessful,” said Narasimha Murthy G., of Horticultural Research Station at Pandirimamidi, Andhra Pradesh, one of the centres of All India Coordinated Research Project (AICRP) on palms. “In Thoothukudi and Tirunelveli, we found naturally occurring short varieties, flowering at four feet height. We have planted their seeds at Killikulam, but they flower after 15 years,” said Prabhu. Theri Kumar, whose father sells jaggery to exporters, said that it is financially viable, since men tap and women make jaggery by boiling neera. He cited some traders selling adulterated jaggery weighing against the artisans. Vengaiah P.C, a scientist at AICRP Pandirimamidi project, concurred that jaggery has good income potential. “We’ve developed post-harvest technologies and standardised procedures to make palm products. We’ve been selling 30 kg of jaggery every day since January 2019, proof that it’s commercially viable,” he said. A senior official at TNPFMF said that the jaggery-dry ginger coffee they have been selling in Chennai for a year has earned them Rs. 3 million (Rs. 30 lakh). Having met with artisans of palm cooperatives, convincing them to make non-edible products too, he is hopeful of their sustainable livelihood. Given the awareness about their climate resilience and health benefits of palmyrah products, things are looking up for palmyrah trees. Working professional Rasu Mayilvahanan, promotes sustainability by engaging women to make utilitarian and decorative palm articles. Photo by Jency Samuel. This story was first published on Mongabay and has been republished with permission. The original article can be found here.